The book is a novella, and is 156 pages. It’s a quick read and I thoroughly enjoyed the story. The pace is consistent and you don’t get bored. Since it is a novella there is a lot that is ‘skipped over” you could say. Honestly, this really could have been longer with the gaps filled in, ending up a longer book and still have been a good, fun read. Carol is such an excited young lady who absolutely loves Christmas; as well she should being Santa’s daughter. Her happiness is contagious. She easily fits in with the family, and you can just feel her presence through the words on the page. I sure wish I had someone like this girl, to whirlwind into my life! So many people see Christmas time as a time of sadness. Depression and anger sets in. The author nailed Ben’s Christmas anxiety right on the head. I, myself, am a Bah Humbugger so I totally empathize with the character. I honestly cannot wait to read more in the series. It’s such a fun, light-hearted story. It’s a good break from the more serious books I usually read. Get it for FREE right now on Kindle! Get this audiobook for FREE with your trial of Amazon Audible. With Christmas only three days away, Carol Claus agrees to her father's request that she leave the North Pole on a mission to help save Christmas. Joining single father Ben Hanson and his children for the holidays seems an easy enough task until Santa informs her that Ben is the man behind the disturbing new book 'Beyond Bah Humbug: Why Lying to Your Children about Santa Claus is a Bad Idea'. 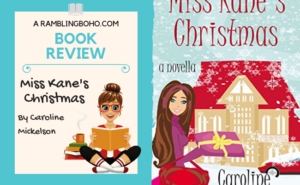 Posing as Miss Kane, the children's new nanny, Carol pulls out all the stops to show Ben how fun Christmas can be, all the while struggling to understand how one man could hate the holidays so much. How could she, Santa's only daughter, be so attracted to a man who refuses to believe her father exists?